Providing a complete package of body cage and accessories for your Blackmagic Design Pocket Cinema Camera. 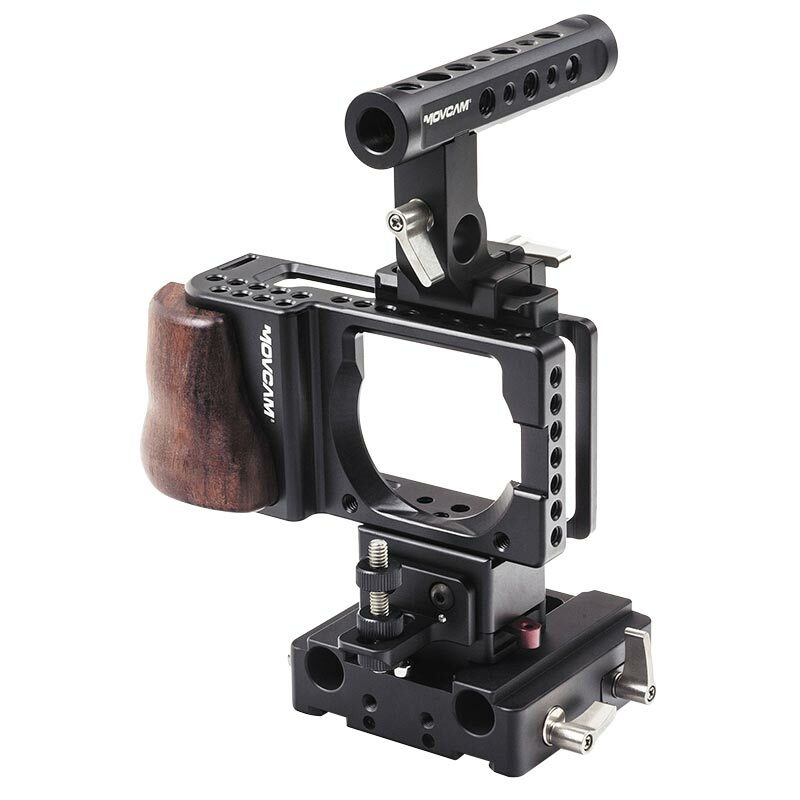 The Blackmagic Pocket Cinema Camera Cage Kit includes; top handle, rod support, riser and lens support. Allowing you to mount your camera on a tripod, use optional rod mounted lens accessories, or attach optional accessories to the cage without stressing your camera's body. The Top Handle expands the functionality of the Body Cage, giving you an additional handhold and accessory mounting. The included Riser Block provides the correct lens center to rod height when used in conjunction with the included Rod Support and available, but not included, 8" support rods. This allows you to use industry standard rod-mounted accessories with your camera. The included Lens Support mounts directly to the riser block creating a solid support that protects your camera's lens mount from the weight of heavy lenses. The Movcam Top Handle clamps onto a NATO-compatible rail and features 1/4"-20 and 3/8"-16 mounting holes for adding accessories, as well as a single 15mm rod port. It is designed for use with the Movcam Body Cage for Pocket Camera when an optional NATO rail is added, but will work with any NATO-compatible rail. The Movcam Body Cage For Blackmagic Pocket Cinema Camera is a black, anodized, full body, protection cage for your Blackmagic Pocket Camera. The camera slides into the cage and secures to the top of the cage using the two included mounting screws. Featuring a mounted wood handgrip and 1/4"-20 accessory mounting holes for mounting accessories to your camera without stressing the body. The cage protects your camera body, while allowing full access to your camera's connection ports, LCD screen, and battery compartment. The front of the cage has a wood handle to reduce weight and a rubber pad cushions the camera where it contacts the front of the cage. Machined into the cage are two slots for optional accessory straps. On the bottom of the cage is Movecam's Lightweight Support System, which allows the cage to mount to an optional Movcam Camera Spacer.